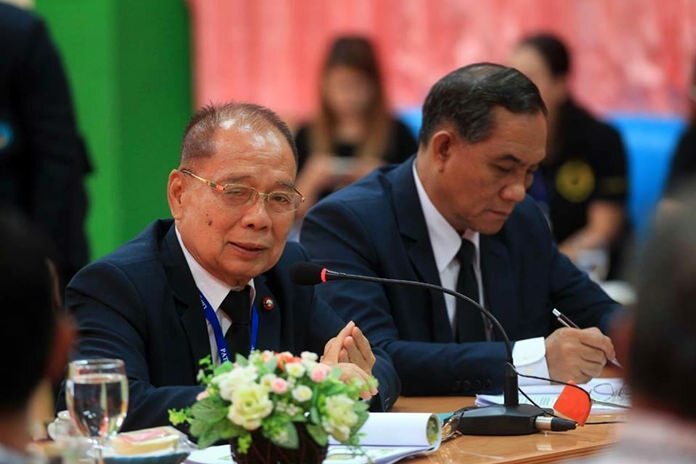 Pattaya City Council Anan Ankanawisan and deputy chairman Srivisut Rodarun open a meeting to discuss the barriers holding back the educations of Thai students. Pattaya City Council members visited Pattaya School No. 1 to see for themselves the barriers holding back the educations of Thai students. Council Chairman Anan Ankanawisan led the May 27 delegation May 27 to meet with administrators and teachers, part of the councilors plan to visit all 11 public schools. They met with Warasai Paksarnsri, director of the Institute of Monks, and abbot of Kratinglai Temple, and Nopsitcha Nanakorn, director of the Education Promotion Division, who sat in for the director of the Office of Education and Teacher Education. They gave an overview on school histories and while Tipwan Yimpong, deputy director of education, detailed the issues and needs. School No. 1 was established on Sept. 1, 1955 and was known as Wat Kratinglai School, which was at the time part of the Chonburi Provincial Administrative Organization. It became a city school once Pattaya was established in 1978. The school grounds cover seven rai and teaches kindergarten through high school. Currently the school has 792 pupils. Over time, the school’s infrastructure has degraded, especially the drainage system, which is not connected to city sewers. Flooding is common. The flooding affects the kindergarten building greatly, damages various surfaces, narrows the road entrance and causes holes to appear. During the meeting Anan acknowledged the issues and assigned school administrators to collect more information to present to educational officials later.